With the state weather bureau warning of heavy rainfall in some parts of Luzon for the next several hours, local government units in several cities and municipalities have announced the suspension of classes for tomorrow, August 19. According to the Philippine Atmospheric Geophysical and Astronomical Services Administration (PAGASA), Metro Manila, Bataan, Zambales, Bulacan, Pampanga, Tarlac, Nueva Ecija, Rizal, Cavite, Laguna, and Batangas will experience heavy to intense rains until Monday. This weather condition is caused by southwest monsoon (habagat) enhanced by Typhoon Maring. 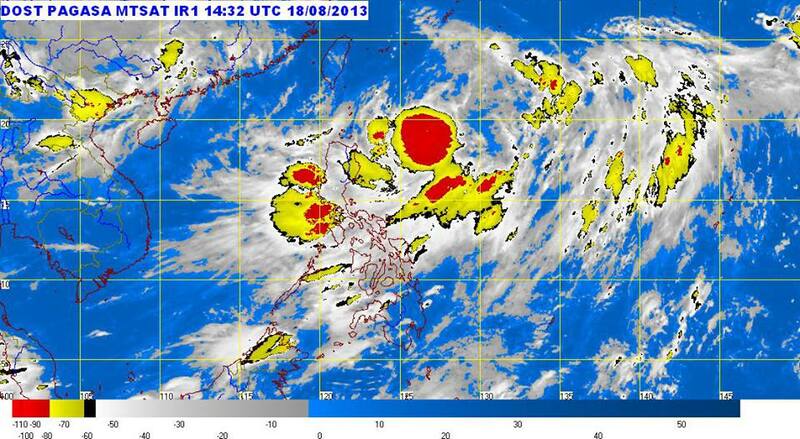 Typhoon Maring has intensified the southwest monsoon in Luzon.